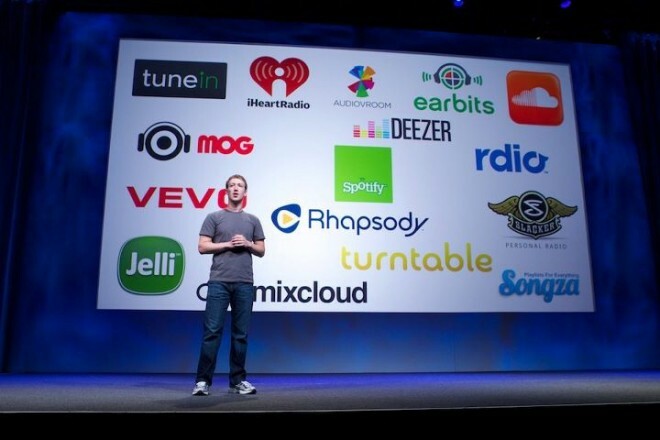 The Facebook Music initiative links the social network with many music services. At its most basic level, Facebook now lets you A) let your friends know what you’re listening to on supported music services and B) listen to what they are listening to or played earlier. Facebook music marks a big change to the service, and because Facebook likes to change its layout, features and privacy settings without letting you know, some casual users are feeling overwhelmed by the change or, at the very least, out of the loop. As promising as Facebook Music is, it is not without flaws. For starters, it has nothing to do with iTunes, which is what many people who don’t spend all day thinking about digital music still use to listen, and justifiably so. Instead, you’ll need to try one of these supported Facebook music services, which fall into two categories: on-demand unlimited services (MOG, Spotify, Rdio, Rhapsody) and internet radio services (AudioVroom, Deezer, Earbits, iHeartRadio, Mixcloud, Slacker, Songza). While a long list of apps connect to Facebook Music, Spotify could deliver the most rewarding social music experience in the long run. For one thing, Spotify CEO Daniel Ek appeared alongside Mark Zuckerberg at the F8 conference where Facebook Music was unveiled, and Zuck said he “really loves” the service. The fact that Spotify recently started requiring its users to have a Facebook account, while annoying to some, underscores the tight relationship between the two services. 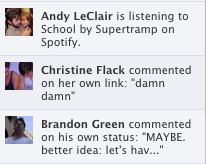 Facebook's Ticker gives you a real-time update on what your friends are listening to. One of the more striking features of Facebook’s recent redesign was the Ticker, a real-time news feed that you can turn off at the bottom of the screen if you find it intrusive or obnoxious, as some do. If not, it’s a great way to discover stuff serendipitously. Located at the top right-hand corner of your Facebook interface, this Ticker feature acts kind of like a mini-Twitter feed for Facebook. Anytime one of your friends does seemingly anything at all, from tagging a photo to liking a status, this Facebook Ticker updates you on it in real time. As expected, this is where the music your friends are currently listening to gets shared. If you’re looking for quick song recommendations based on what your friends are playing at approximately that moment, keep your eyes glued to the top right of your screen. You can click the item to listen to the same thing and leave a comment. It’s an easy, if somewhat scattershot, approach, because the Ticker moves pretty fast. For those seeking a simple overview of their friends’ listening habits, uncluttered by the Ticker’s glut of extraneous information, the Music page is way more helpful. To find your own Music page, go to your Facebook profile page, then look under the Apps header in the column on the left side. You can do the same thing with your friends, via their profile pages. Their Music pages collect all their Facebook-connected listening activity in one convenient location. Here, you can peruse (and potentially listen to) all of your friends’ recent songs, as well as a Top Songs list that aggregates all their listening data into one chart — the Billboard Hot 100 of your Facebook friends. Here, you can also decide who — exactly — gets to see what you’re listening to. Under “App Activity Privacy,” a drop-down menu can customize the group of people you’re sharing information with, from “Friends” to “Friends of Friends” to “Public” and everything in between.